RAWIllumination.net: Did RAW lose two unpublished novels? I've been wondering for awhile why Robert Anton Wilson didn't finish his "Historical Illuminatus" series. Three came out. I thought The Earth Will Shake and The Widow's Son were excellent. Nature's God has many fine moments, but seemed to me to have a bit of an unfinished feel. In any event, as this Wikipedia entry relates, there were supposed to be five books in all, and the name of the fourth had been released — The World Turned Upside Down. So what happened? The Wikpedia entry gives the accepted answer: Wilson never got around to writing them. But Philip Brett, a member of the Robert Anton Wilson Fans Facebook group and a California resident, has come forward with another version of the story. According to Mr. Brett, Wilson completed the books, but lost the manuscripts. "I first asked him at a book signing for Everything Is Under Control. I was the last person on line. He politely blew me off. I knew someone who was roommates with Rosemary, Timothy Leary's widow, so I met and talked to him at a memorial party. I wound up being part of a group that would watch movies and read his books. I think it was a little while before I asked him. I'll say it was 1999. The third volume had an excerpt of the fourth which never came out. He explained to me the publisher went out of business. He got another but the book didn't sell well since he was a cult author and most people who were interested bought them the first time around. The publisher didn't want to continue. He had finished the fourth and the fifth needed some editing. They existed on a computer as manuscripts. He said all of it had been lost in moving around and by mistakes. I had the impression he wasn't blaming anyone else. He said it was the biggest heartache of his professional career. He was sad telling me this. I felt bad. He talked about bad editors and having trouble getting royalties from some publishers after that. That's about all I remember but I would try to answer any questions you might have." As a follow up, I wrote back to Mr. Brett: "I'm confused about how the books could have been lost if they were on a computer. Was the computer itself lost? Because if he had a hard drive crash, it's possible that there could have been some way to recover it. "It's sad if important work was lost. I've noticed that he didn't make any provision, either, for the preservation of his literary papers." "I am speculating that they may have been deleted by mistake; he was not the most computer literate person in the world, or it may have been damaged. I also think it may have been one of his kids but he left that out when describing it to me. The fact remains that they are lost. As for his papers I think that anything that he had done that he wanted to be released went into Email to the Universe." He suggested a couple of other people I could write to for more information. I'll see what I can find out, but does anyone reading this have any information? The first two volumes were reprinted by Onyx, which went out of business. The third volume was published by Signet, which certainly didn't, in 1991. A couple of years later I had a brief freelance gig with Signet, and I asked the sf editor (Amy Stout?) if they were doing the fourth volume, and she said she'd love to see it. My Blogger settings show that word verification is turned off, so I'm kind of at a loss on what to do to make commenting easier. "Unable to comment on site because I don't have blog account but I interviewed Bob shortly before his death for a radio show..."
"He told me that 4 was partly written but not complete; 5 only plotted (to culminate in debut of Beethoven's 9th Symphony)..."
"Due to publishers going out of biz and unpaid royalties he was too frustrated to finish them. A shame." I think RAW talks about it a bit in "Robert Anton Wilson Explains Everything" and sounds similar to what @westcoastsexgod says. Also, there was a bit about how he wanted the series to eventually end on a space colony. If not completed manuscripts, maybe he lost his work in progress docs? That would still be a pretty big heartache. ...The pentology deals with 1764 to 1824. Masks of the Illuminati deals with the 1890s to 1914. Illuminatus! is set in the 70s, but has falshbacks to the 1930s and everything in between the 1930s and the 70s. The Schrodinger's Cat Trilogy is set in the 80s and the early 90s and when I write a few more and fit them in a pattern, I'll have a complete history of the Western world from 1764 to 2001. 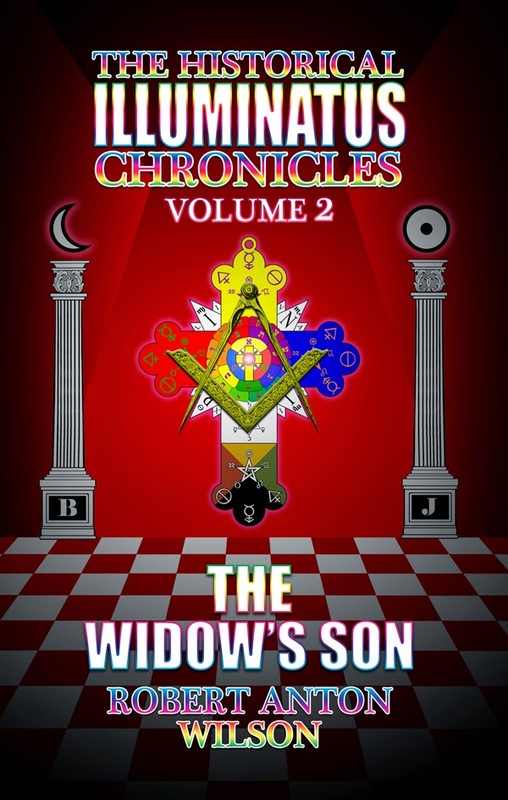 Wolff: Wilson's current series, The Historical Illuminatus Chronicles, is probably his most complex and subtle work to date, but has been plagued with problems. Actually, only one problem, but it keeps popping up. When first published by Bluejay Books, the first two books, The Earth Will Shake and The Widow's Son were released. Before the third book, Nature's God, could be printed Bluejay went bankrupt. Not to be deterred, he found Lynx Books in New York. Again, after the first two were released, Lynx goes bankrupt, and Nature's God, already printed and sitting in a warehouse, gets destroyed because of the legal proceedings. RAW: Well, I think anybody would find it discouraging to have two publishers in a row go bankrupt on the same series of books. A lot of people, when they hear what happened, ask me, 'Does it make you believe in some of the conspiracy theories in the novel?' And oddly enough, it doesn't. I'm just too skeptical. I suppose, if you told anybody, here I am writing this series on conspiratorial groups fighting over the world and two publishers in a row have gone bankrupt trying to publish it. But right now the whole series is due to be published by New American Libraries. If they go bankrupt - they're very well established you know - if they go bankrupt too then I'll start to worry. KT: Do you have a new volume of the Historical Illuminatus trilogy (sic) coming out? I know there's a fourth one planned. RAW: Yea, the fourth one is called The World Turned Upside Down, and when that'll come out I'm not exactly sure. I happen to have a letter Arlen wrote to RAW's friend Kurt Smith, dated July 20, 1989. RAW is in Washington DC at the World Futures Convention. On a slightly different note, did anyone go through RAWs computer after he died to find if there were any interesting goodies, or bits of TOTT lurking in there? I had the impression, though of course could be mistaken, that his family were more interested in paying off his debts, than preserving his literary legacy. I've tried to pose that question, and others who post comments to this blog have tried to ask. As far as I know, nobody's gotten a really good answer yet. The only people who really know are the folks administering RAW's estate and the associated "inner circle," and I'm not part of that. I remember Bob telling me that his experience with the first edition of The Earth Will Shake (Tarcher) was nightmarish, and that seems to have have had an impact on the rest of the series--taken the steam out of it a bit. I loved those volumes, and always hoped for more. I can't imagine there's no unpublished RAW, but it might not be much, since he was pretty prolific and it was his bread and butter, so he was motivated to publish. I really like the historic Illluminatus, and am amazed at its bad luck getting published. I don't remember the date, maybe before vol 3, I asked Bob when he'd finish it, and he said when someone paid him to.